What I love about the humble bundt is its versatility. Whatever the occasion or cake club theme, I always have a bundt in mind! Although I adore my beautifully ornate tins available, I find my Anniversary tin is my go-to tool for pretty much anything and everything. 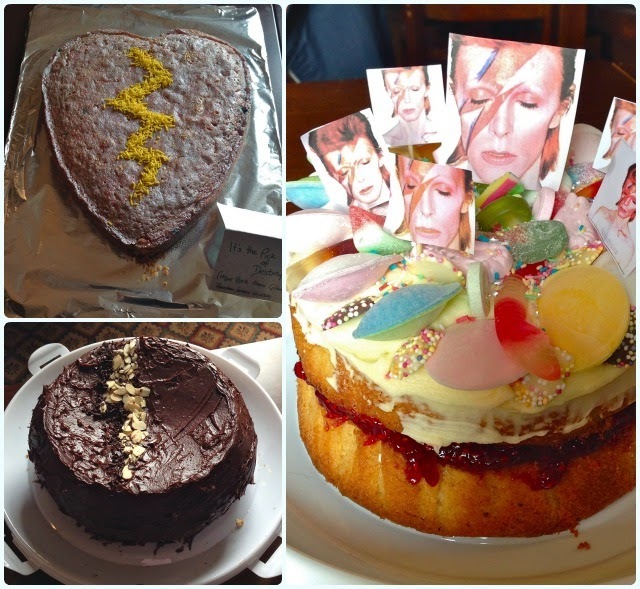 I often get over excited setting our cake club themes, and this month was no different. 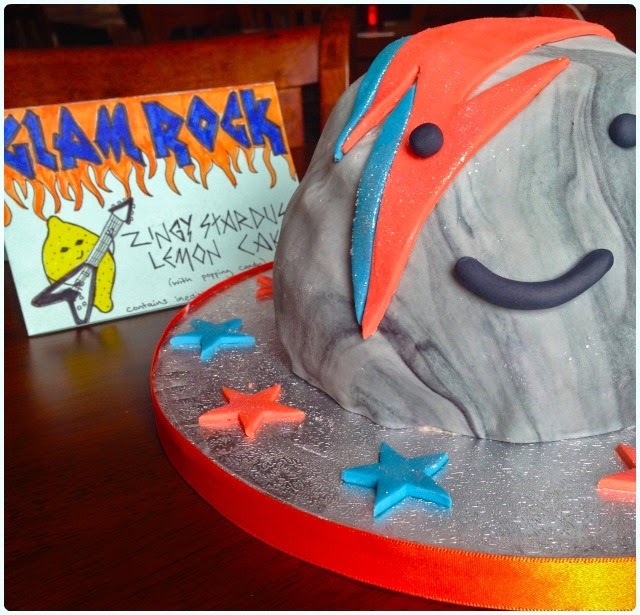 I'm a big fan of the Glam Rock/Hair Metal era, and knew the group would come up with all kinds of weird and wonderful cakes - which they did! I had no idea what to make... and then it came to me. 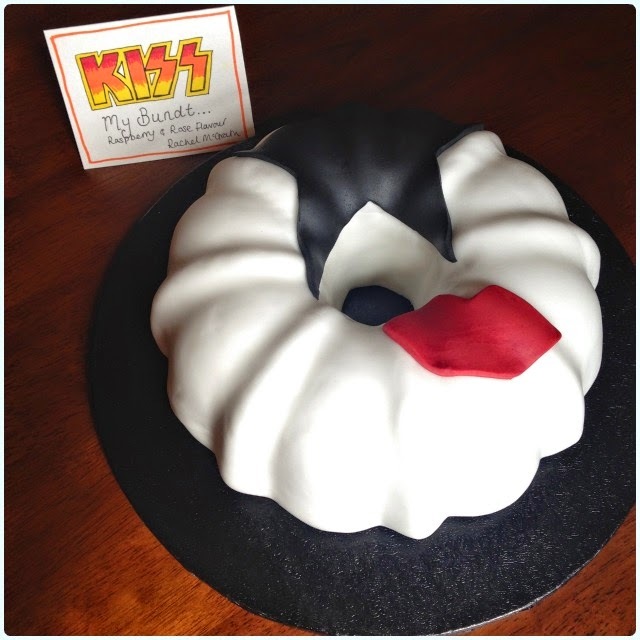 It had to be Kiss! This cake wasn't all fur coat either, it had a delicate rose flavour to go with those kisses. The raspberry just stops the rose water being too fragrant. Minus the make-up this is an elegant cake with a gentle essence of rose - a bit like walking through the garden in summer, or the scent of home made Rose Petal Perfume circa 1989. The small pieces of raspberry just add a little extra flavour. Prepare a regular sized bundt tin - 2.4l, 10 cup, 10 inch with Cake Release spray and dust with flour. Add the vanilla extract and rose water. Pour the yoghurt and raspberry mix into a jug. Sift in a third of the flour mix followed by half the yoghurt. Repeat this until everything is combined. Give everything a quick mix on a low speed for about 10 seconds. Pour the mix into your prepared tin. Bake in the centre of the oven for about 1 hour 15 minutes or until a skewer comes out clean. Leave the cake to cool for ten minutes before removing from the tin. 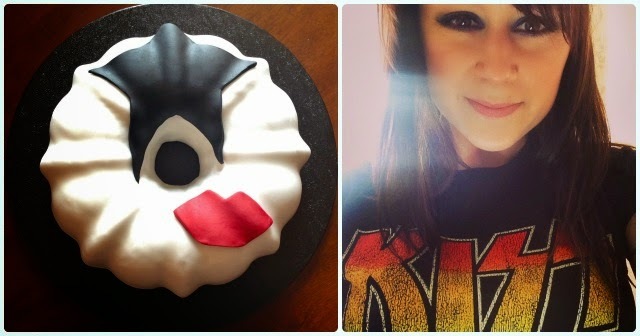 Now I very much doubt that you'll want to decorate yours with Paul Stanley 'Starchild' make up, but if you so fancy it, this can be done easily with sugar paste and a little patience. 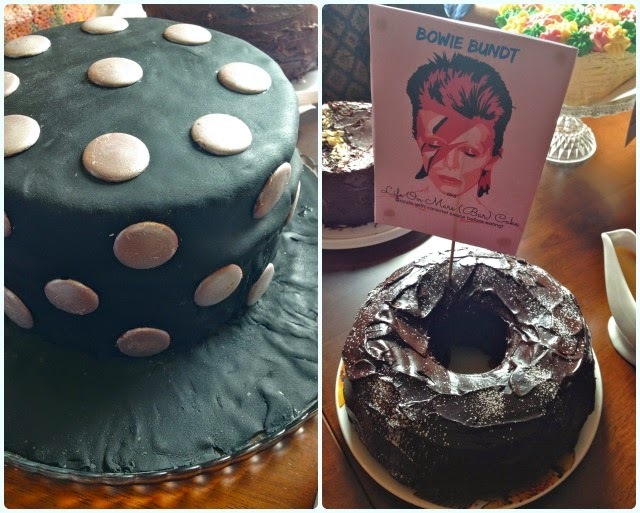 If you want to have a nosey at all the other Glam Rock cakes, the pictures are on my Life on Mars post. 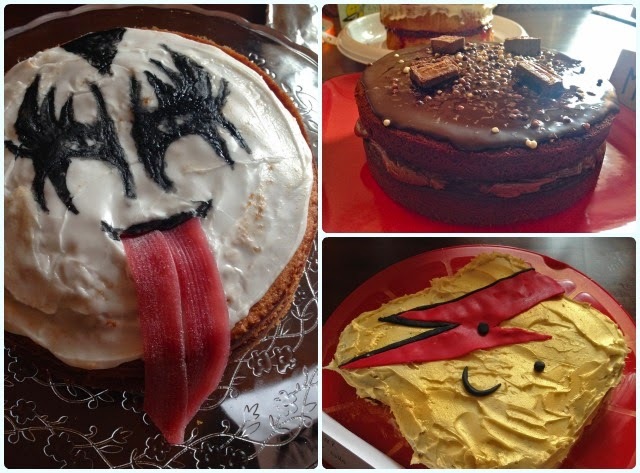 I've been giddy as a little kipper about this one... Today Bolton Clandestine Cake Club went all Glam Rock for our Life on Mars theme. 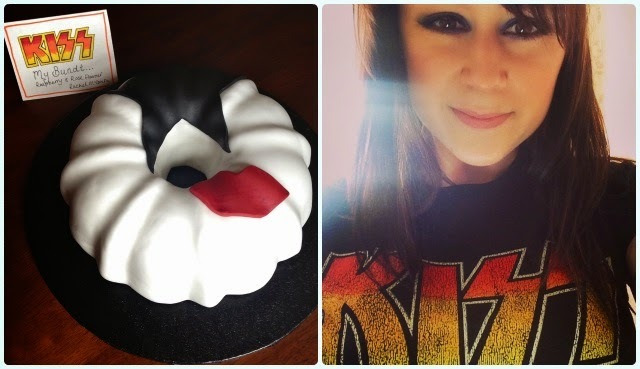 The eyeshadow was out, I had a new t-shirt to match my cake - I was on it like the proverbial car bonnet. 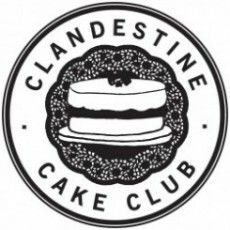 Second cake club in one week? Why not. I love a bit of glam. The hair, the make up, the extravagance and the glitter - bring it on. 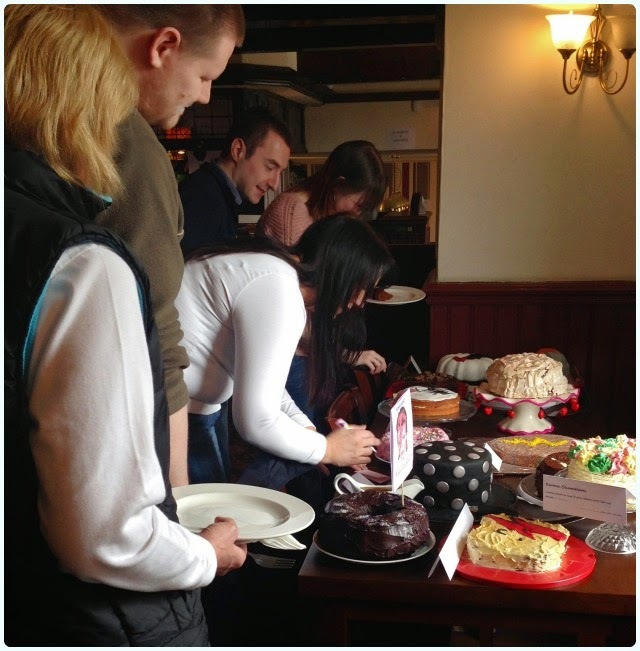 I knew the cake clubbers would come up with some awesome ideas, but didn't expect quite so much artistic talent! As you would probably expect, the cake ache and sugar shakes set in early with such an abundance of sweeties, sugar paste, buttercream and edible tongues on offer. It was nice to see a few new guests at today's club, and hopefully we'll be seeing them having a bash at baking soon too! I'll be loading the next club shortly, and it's got a rather magical theme... Eyes. Peeled. 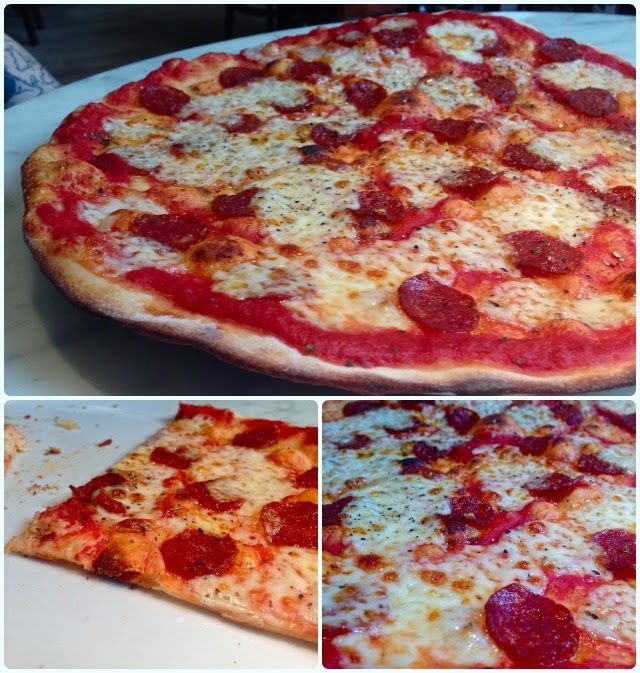 I have a secret love affair with Pizza Express in Bolton. I'm going to be honest with you - it has little to do with the restaurant itself, and was the main reason that I agreed to do a review when approached by their PR team. Let me tell you a story. When I was 14 I decided to become a history teacher. This one time dream would later fizzle out at the thought of a class of sixteen year olds; but was my dream until I was 21. I remember when the idea was born though. Our class went on a field trip to Lord Lever's Roynton estate in Rivington. The sun was shining, Kieran Morris nicked my neon orange Adidas coat, and the ballroom tiles gleamed through the mud and debris in the wreck of the second bungalow. I've been Lord Lever's number one fan ever since. Similarly to now, in 1914 Bolton was experiencing hard times. 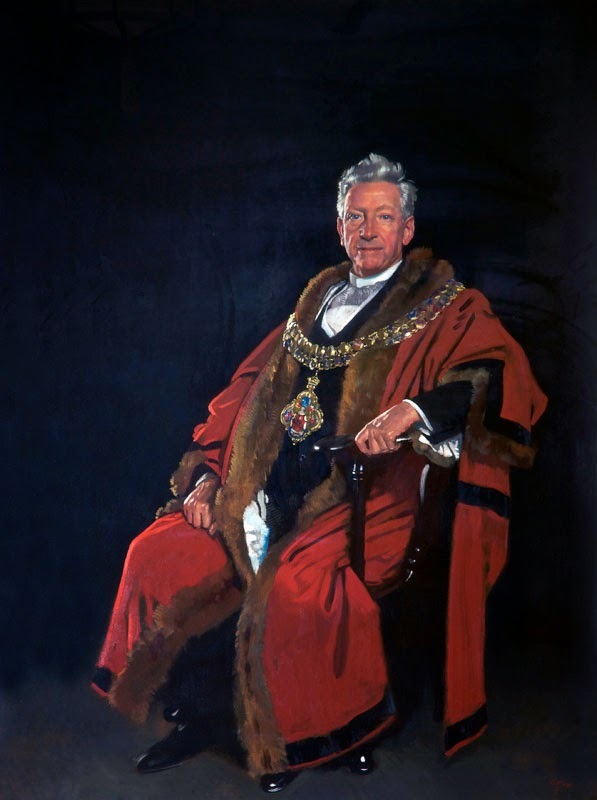 The cost of war meant that Bolton Council could not afford to buy the desired parklands they so wanted for the the residents of the borough to enjoy. In stepped Lord Lever. I won't bore you with the details, but needless to say without his philanthropic gestures, Bolton would be very different today. William Hesketh Lever was born on 19 September 1851 at 16 Wood Street, Bolton. 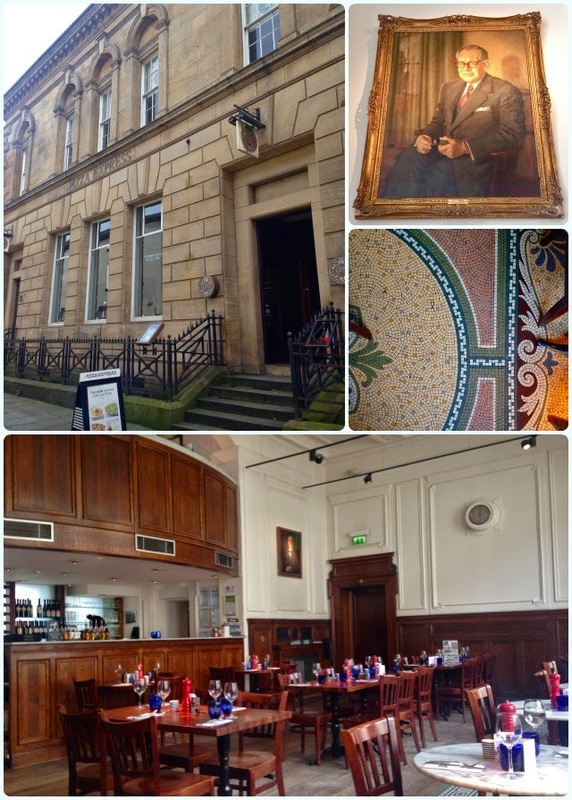 In 1849 the Bolton Savings Bank had been built on the site of an old timber yard, just a few doors down from the Lever household, and still stands proud as the home of Pizza Express today. Forget the branches you find in city centres and shopping complexes, this is a building with class. Still a listed site, the beautiful floors remain, and the decor is sympathetic to the building's past glory. We've eaten here many times in the past, as up until recently I worked in the town centre; it's been the site of many a leaving do, Christmas meal out or post-work nibble. As a general rule, I'm not a massive fan of pizza, but I have to admit to enjoying the ones on offer here. We were greeted by a pleasant chap who offered us drinks and nibbles whilst we looked at the menu. Roasted tomatoes: We picked these as neither of us are overly thrilled with olives. Unlike the sunblushed variety, these were actually quite tart. 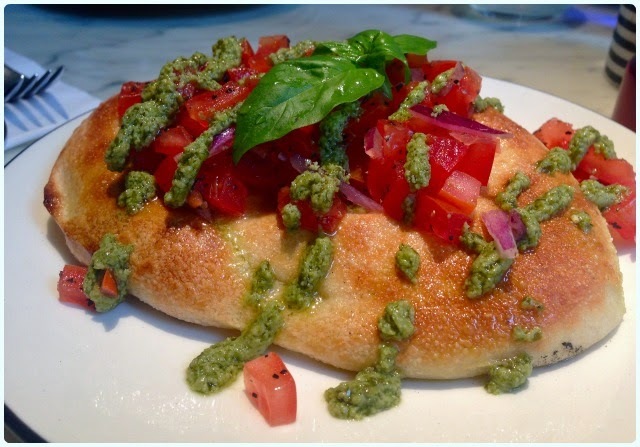 Bruschetta Originale "Pizza Express" - tomatoes, red onions, garlic, fresh basil and pesto: This was heavenly. A waft of fresh bread hit us as it was set on the table; the centre was soft and fluffy and the salad crisp and fresh. 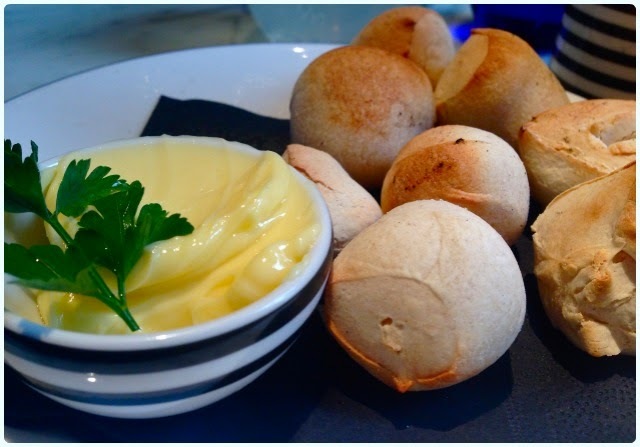 Doughballs with garlic butter: They don't look much, but I cannot resist a decent dough ball. Once again, a nice crisp exterior with a fluffy middle. No faff. Pizza American on Romana thin base - Pepperoni, mozzarella and tomato: My husband's pizza of choice. Everything is cooked fresh to order, so you get it exactly how you want it too. He had polished the whole thing before I had eaten a quarter. I think that means he liked it. 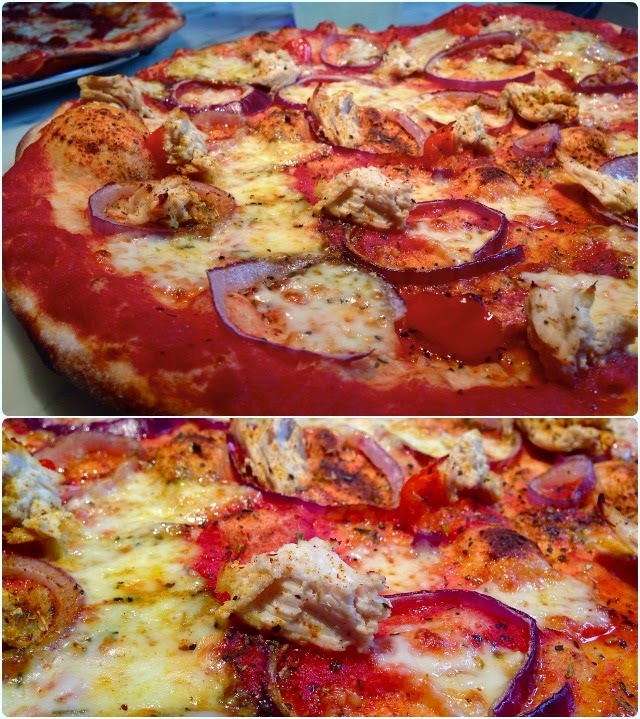 Pizza Pollo ad Astra - Chicken, sweet peppadew peppers, cajun spices, garlic oil, red onions: I have this every time I go to Pizza Express. Plenty of toppings and a nice bit of fire in the peppers. My only criticism (and tis is true of all pizza establishments) is the lack of a decent knife. They are too big to pick up as slices, and the blunt knives are more likely to injure me than cut pizza. 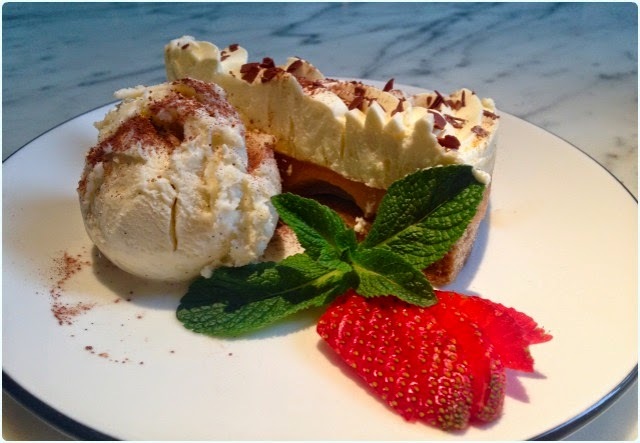 Banoffee pie and ice cream - banana, toffee, cream and crumbly biscuit: I'm always doubtful of desserts served in chain restaurants. Whilst I'm sure these are not home made, they were much better quality than the 'fresh (from the freezer)' types sold elsewhere. My husband ate it all anyway! 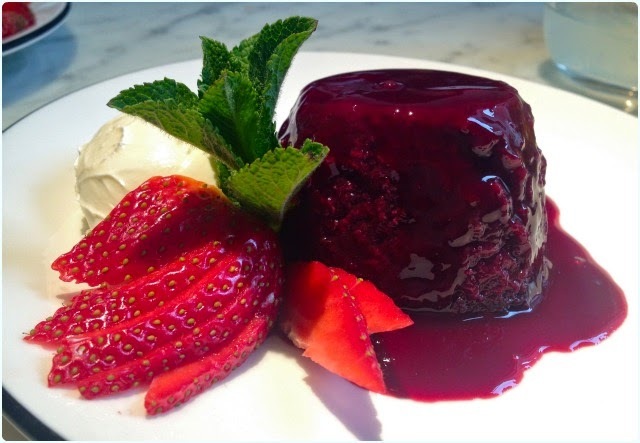 Summer pudding - summer fruit berries, served with fruit coulis and mascarpone: I found the bread in this a little too dense, but really enjoyed the sharp coulis and fresh mascarpone. Bolton is a struggling town. There is much more happening in its culinary world than this time two years ago, but much of that is going on in the outskirts of the town. Whilst the likes of Tiggi's and Pacha Mama have departed, Pizza Express has been there the whole time. Whilst I don't normally do reviews of this nature, I was eager to do this one because of the location, and the fact that Bolton needs all the help it can get at the moment. It is what it is. Nothing fancy, but they are serving freshly cooked food at a decent price. Its location is as much of a selling point; a little oasis in a sea of pigeons. I've been a bit absent in the whole 'Manchester dining scene' recently. To be honest, I've been pretty busy with a new job and baking too many cakes! 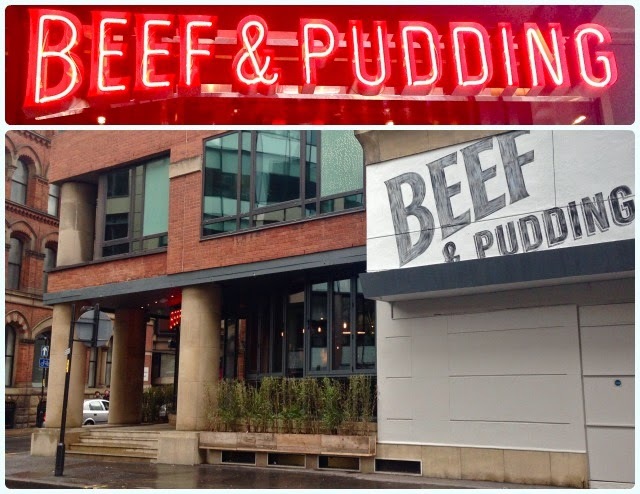 I only found out Beef and Pudding was opening when I got an email from them. We couldn't make the preview nights, but we were in Manchester on the opening weekend for the Cake and Bake Show. It's just round the corner, so it would be rude not to eh? Their corner site is impressive, with a smart exterior and those flashy neons that attract foodies like moths to a glowing lightbulb. Inside is just as grand, with a mixture of high benches, regular tables and leather booths. We could see into the busy kitchen, which appeared to be run like a well regimented battalion, with staff running round left, right and centre. Cracked black pepper potato skins - raw heirloom tomato, basil & red onion ’stew’: Imagine Southern fried chicken... now apply that principle to potato skins. Yes my friend. Yes. Delicious. I was utterly devastated that I had to stop at four for fear of not being able to manage the rest of my meal, but alas, our server wrapped them up for me to take home. Raiding the fridge at 8pm that night - smug. Nearly a pig's ear - Andy Holt’s black pudding, pig cheek, lentil & Tatton ale gravy, curry spices: Subtly spiced with excellent texture, this was warming and meaty. Happy husband. The pudding - Beef & Barbon Fell venison suet pudding, horseradish paste, stockpot gravy, mash, black peas: The signature dish. 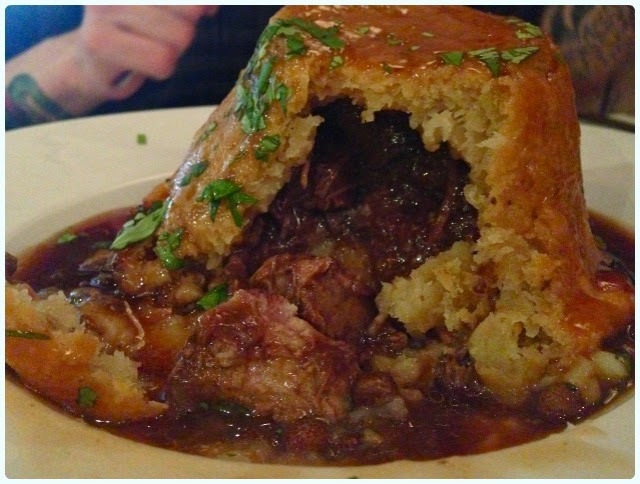 Packed with hearty chunks of meat and oozing with gravy. Strangely, the star of the show for me was that rich yet oddly light suet pastry. 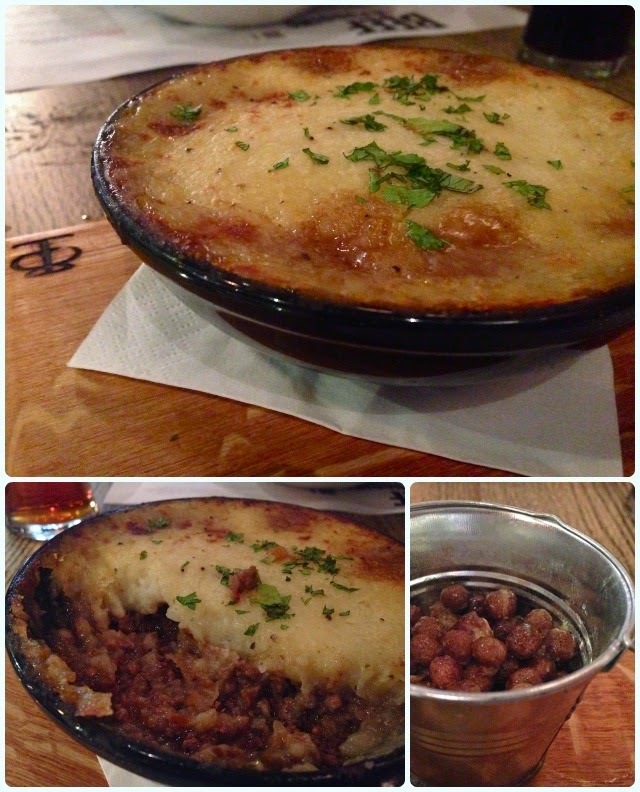 Cottage pie - prime British beef, simmered in gravy, seasonal vegetables, mash potato, buttered black peas: As a wee one, my dad called me 'Cottage Pie Burns'. No, he wasn't crackers and Burns is my maiden name. I loved the stuff. I couldn't get enough of it apparently! The inner yearning forced me to opt for it. Hotter than the surface of the sun but utterly delectable! I wasn't thrilled with the black peas, but they weren't a deal breaker. 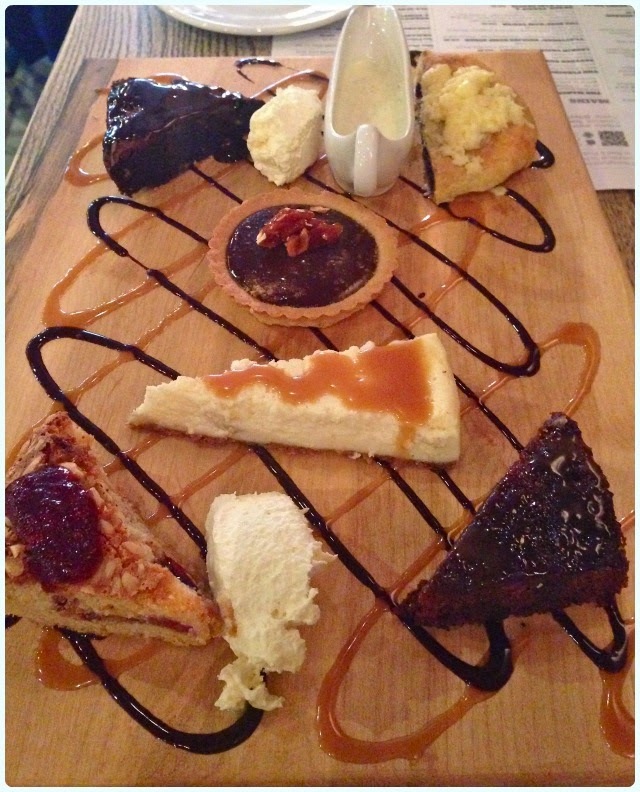 The Pudding Plank - Sticky Toffee, Chocolate Tart, Cheese Glazed Eccles Cake, Bakewell Pie, Banoffee Cheesecake, Custard, Whipped Cream, Chocolate Sauce: The mother of all dessert platters. My favourite had to be the Bakewell pie, closely followed by the sticky toffee pudding. The latest addition to the New Moon family appears to have hit the nail on the head. 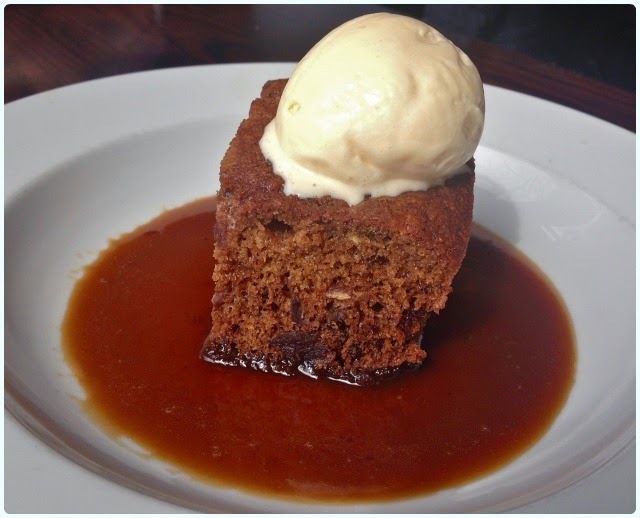 Manchester has an explosive dining scene at the moment; more bloggers than you can shake a fork at, somewhere new opening every week, a real hunger (sorry) to fill any culinary gaps in the market... a decent gastropub is just so obvious, yet has been strangely absent from the city's dining scene. Don't get me wrong, there are plenty of pubs doing decent food, but nothing to rival the likes of those you see in the Ribble Valley. Whilst the country cottage dwellings and rolling moor-sides have their appeal, I don't feel it's essential for the overall experience to work. 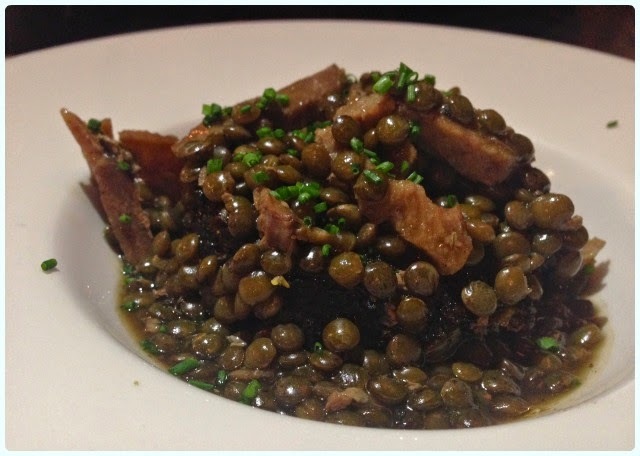 Here sits a modern gastropub, sans thatched roof, serving up hearty British meals in the middle of the city. 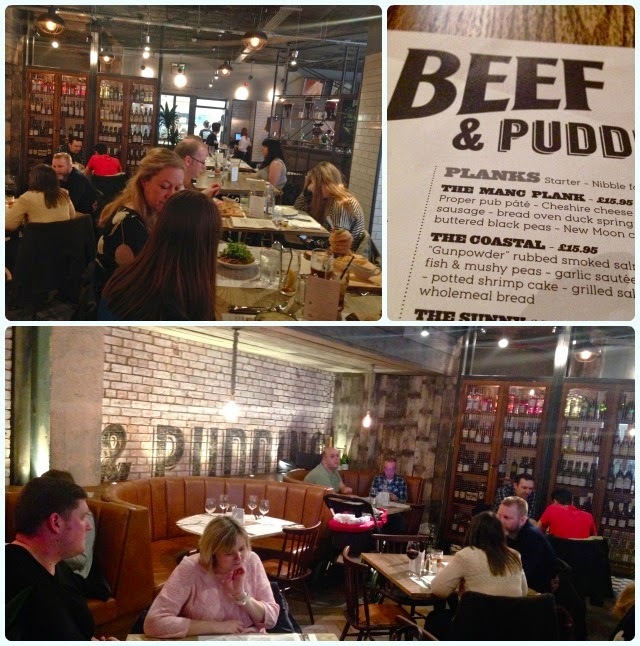 Tweed has been replaced with tan leather and fireplaces by bare bulbs hung by rope, yet the punters are pouring in, and Beef and Pudding is the new diners' darling. 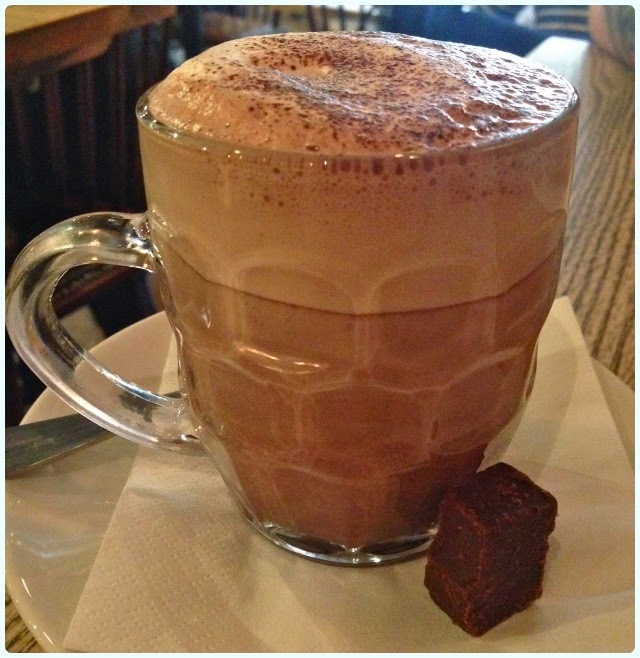 Plus they serve their hot chocolate in mini tankards... the crazy mothers. Easter baking rules. Pretty pastels, hot cross buns, fruit cakes, biscuits, chocolate... the list goes on my sweet-toothed tribe of bakers. I love the Easter break, not only do we get two Bank Holidays, but the weather is usually improving too. This is the perfect time to whip up some sweet treats for your nearest and dearest. So then, show me your buns... I want spice, flavour, garish fluffy chicks and terrifying bunnies - the whole shebang! Add a link on your post to your host DollyBakes. Laura is having a break from blogging for a bit, but will hopefully be back soon! If you don’t have a blog you can still join in, just share the picture online (Facebook, Twitter, Instagram, Flickr etc), right hand click on it and copy image URL or link address. Add this to the Linky et voila! If you're on Twitter, tweet me a link to your post @dollybakes. You can enter as many times as you like. Bake to your little heart's content. It can be your own recipe or one you found elsewhere (please just state where you found it). 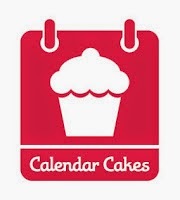 You can use old posts as long as you update them with the 'Calendar Cakes' logo and link back (see above). If you want to enter your bake into other challenges too then please feel free. You must submit by the last day of each month. 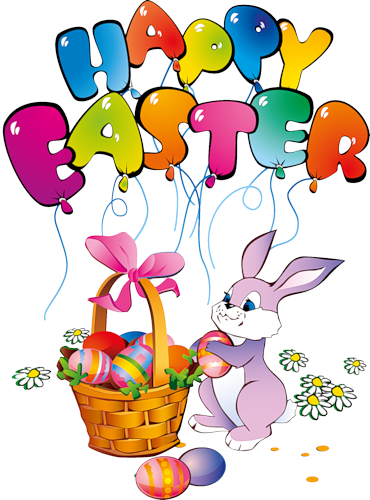 When I was a nipper, Easter was all about overindulgence; chocolate eggs, buffets and thanks to my dad, lots of cake. As I've got older, I've binned off the chocolate eggs in favour of big, spiced cakes decorated in accordance with the season. Oh yes, and they often sport a garish fluffy chick - got to have a fluffy chick. 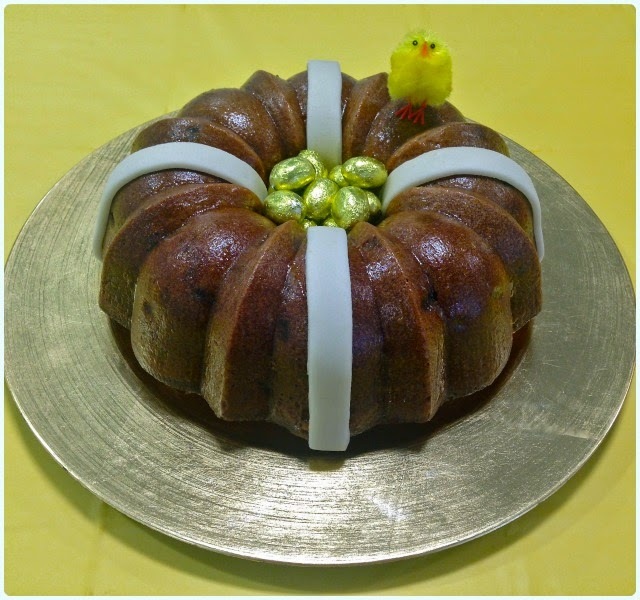 Last year I made my Easter Simnel Bundt. I am my father's daughter alright. It seemed only fitting that this year I make something similar, but with a slightly different theme. I went back to the drawing board. What's my favourite thing about Easter? That's right - hot cross buns. They're spicy, fruity, juicy and sticky, perfect toasted or just buttered, ideal for breakfast, a mid-morning snack or a sweet treat in the evening. Winners eat hot cross buns. You heard it here first. I've been toying with this idea for a couple of years, but I finally got my act together and did it. The name is begging to be used... Hot Cross Bundt. There - I said it. Today was my last day in work before the Easter break, so I took in some goodies for my team. 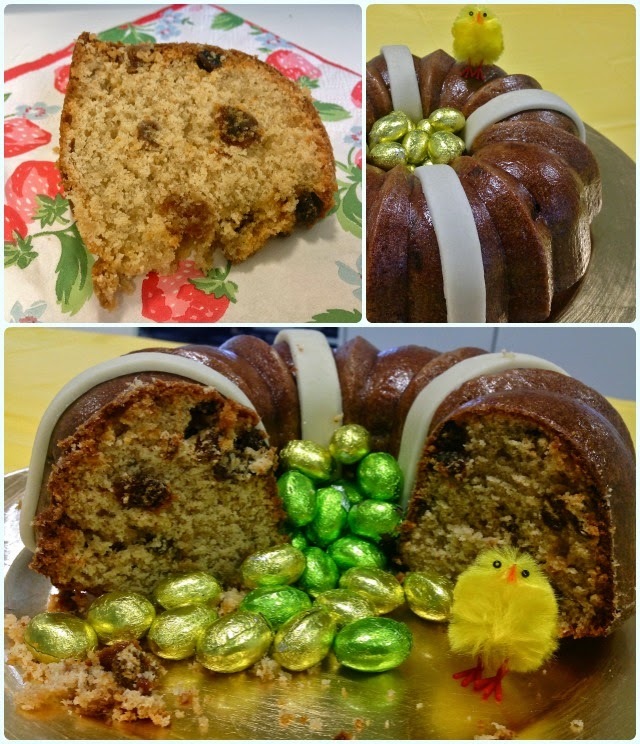 I supplied enough hot cross buns to feed a small army, a bowl full of chocolates and this huge bundt cake! I replicated the wonderful sticky glaze with a bit of jam, and made those iconic cross marks out of natural coloured marzipan. Its dazzlingly shiny exterior was the source of many oohs and ahhs, and made for a deliciously chewy crust, hiding a soft, moist centre. We all loved this one! On a slow speed add the eggs one at a time, beating well after each addition. Mix in the vanilla and orange extracts. In a separate bowl, measure out the flour, spices, bicarbonate of soda and salt. Mix the sultanas and peel into the flour mix and stir. Sift in a third of the flour mix (yes, the fruit will get 'trapped' in the sieve!) followed by half of the yogurt. Repeat until all the flour and yogurt is used up. Give a quick mix on a medium speed for about 10 seconds. Bake in the centre of the oven for about 1 hour 15 minutes or until a skewer comes out clean and it is shrinking from the tin slightly. Leave it to cool in the tin for ten minutes then turn out. Warm your apricot jam ever so slightly in the microwave. 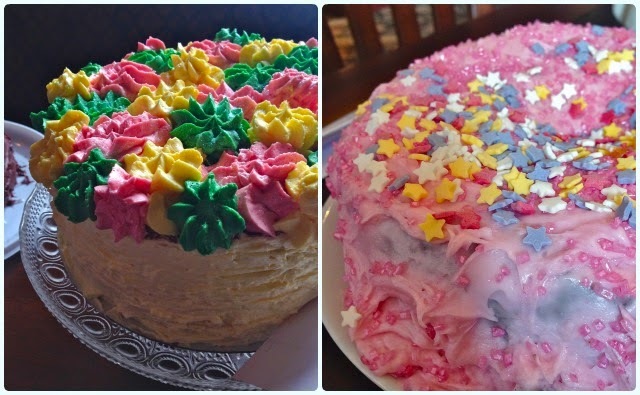 Using a pastry brush, cover your cake. Roll out about 1/4 pack of marzipan, and cut 4 strips for your cross. Place on the cake, trim the edges, and away you go! Have you ever fancied making your own chocolates? Perhaps as gifts for family and friends, or just to fuel your own cravings (we've all been there)? I've teamed up with Virgin Experience Days (see here) to give away an organic chocolate making experience to one lucky follower. You can even pick whether you go to Brighton, London or Manchester. By the end of the workshop you will have learned a bit about the history of chocolate from bean to bar, partaken in some essential taste testing, and more importantly you will make and decorate some truffles of your very own. You don't even have to share them with anyone - perhaps just forget to tell people you're going...? Fancy getting your truffle shuffle on? Entering is easy, just nip over to the Virgin Experience Days Competition page and follow the instructions. Good luck! I'm so not down with the kids. I know nothing of current children's TV, and don't even know the names of the Minions. Luckily, I have April (2) and Jayne (30) to assist me. They're good eggs. 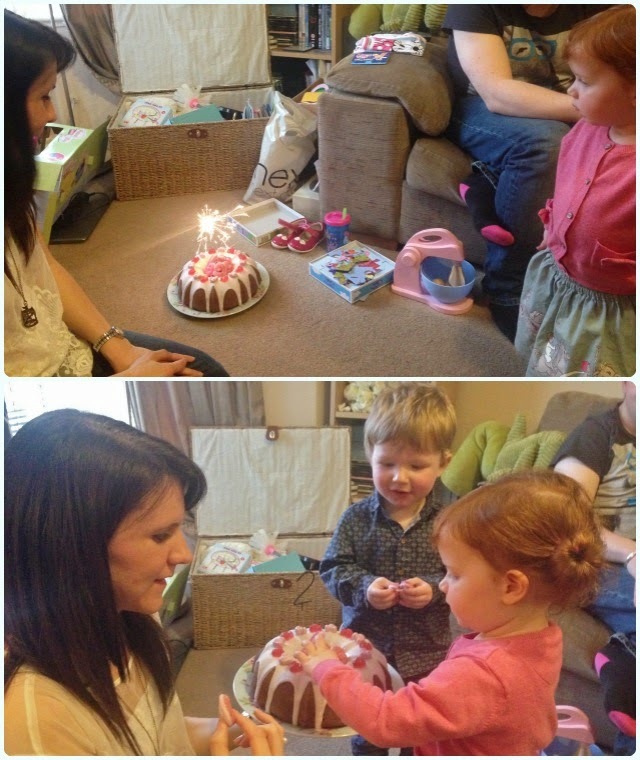 The other week, my little pal April turned the ripe old age of two. Being the daughter of a fantastic baker (no Kev, I'm talking about Lucie...), she was always going to appreciate cake! 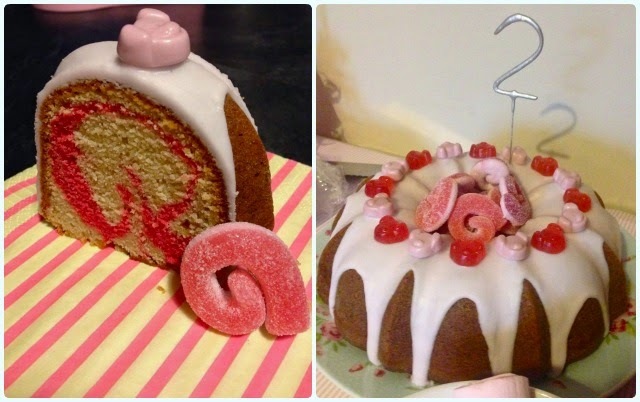 For her birthday I bought her a little pink mixer to match her mummy's, a gingerbread man set, and made her a pink Percy Pig Bundt Cake, complete with a hidden curly tail! I don't think she was overly convinced by the snazzy sparkler, but she was thrilled with the little Percy sweets! This is a really girly cake, and has a lovely surprise in the centre. It could easily be adapted for boys as well though, just change the colours to your given character. 300g icing sugar plus 1 tsp strawberry flavouring. Mix in the strawberry flavouring. Pour the yoghurt into a jug. Remove about 8 tbsp of batter into a small bowl, and dye pink. Put half of the standard mix into your prepared tin. Cover with your pink layer. Tip the rest of the standard batter on top. 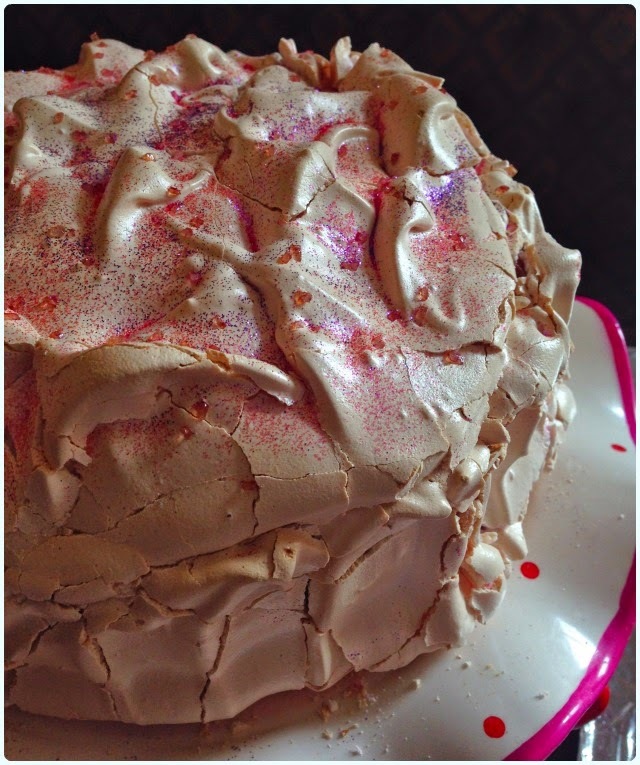 When the cake is fully cooled, mix the icing sugar with 1 tsp of strawberry flavouring and enough water to make a pouring consistency - tip it over the cake and scatter with pigs - as you do. After a couple of weeks of feeling rough as chuff, and generally running round like a mad buffoon, this weekend is all about relaxing. This morning we had a nice lie in, watched some cage fighting, then hopped down the motorway to Fallowfield to sample the new menu at Fallow. It's hiding down a colourful little street off the main road, complete with a building that looked very much like a school bus carrying an elephant and some horrific monkey. Odd. 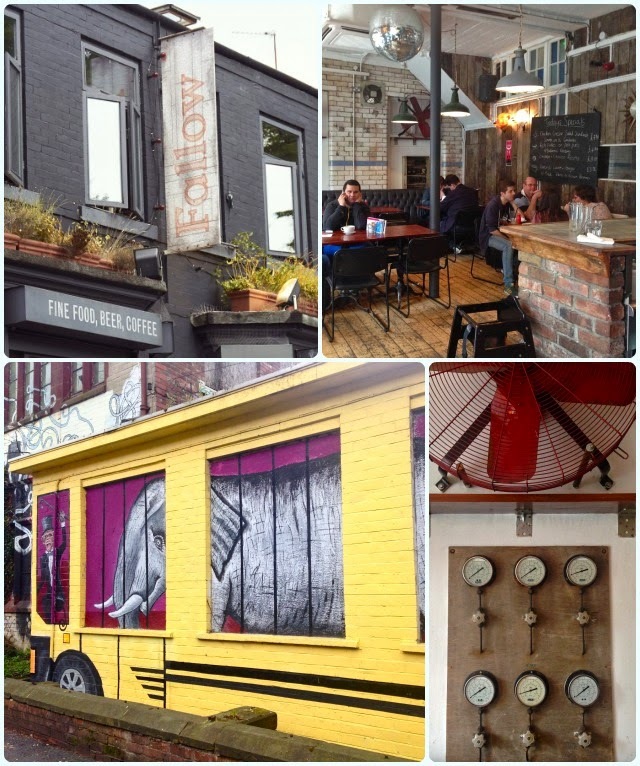 Fallow itself is what used to be Trof, and is owned by the same people who have the Northern Quarter's Ruby Lounge. 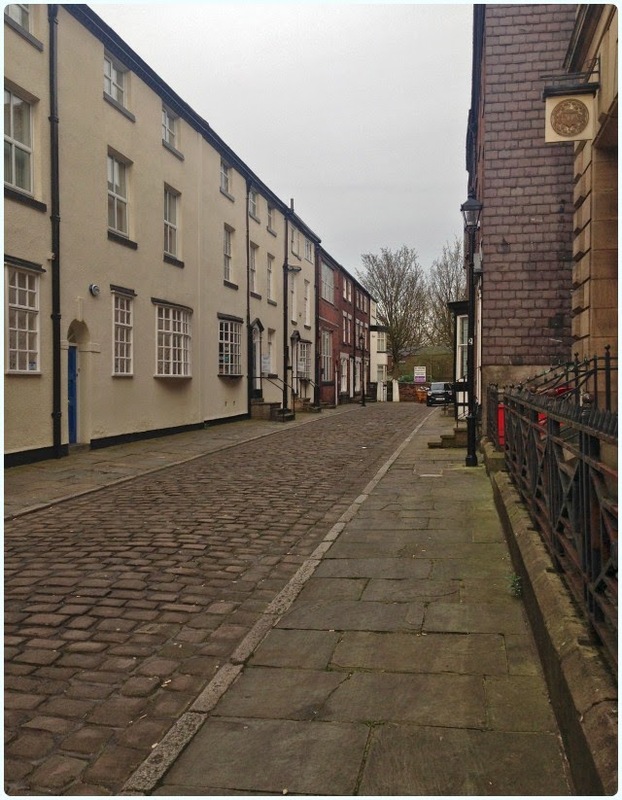 In fact, it has that NQ vibe when you walk in - a bit of a mash up between Common and Home Sweet Home. It's a relaxed affair, with regulars popping in for a chilled out breakfast, a bit of quiet time reading the paper or a leisurely lunch. I was also told that the local running club often commandeer the first floor on a Saturday morning. 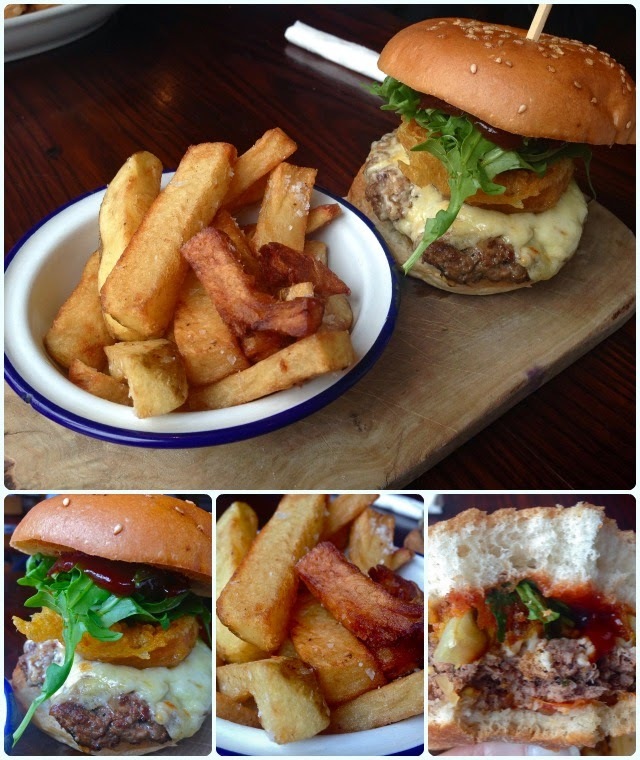 All fresh, all hand-made, home-made and served with generosity and simple old fashioned hospitality. 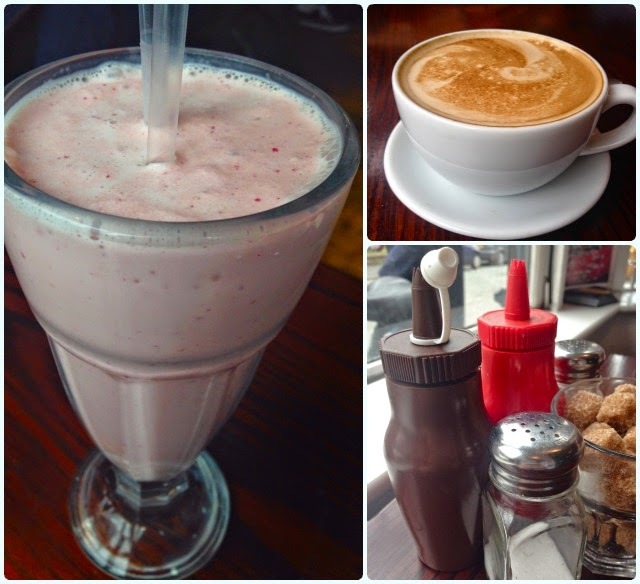 We kicked off proceedings with a flat white and a brain-freeze inducing strawberry milkshake. They have a decent range of soft drinks, and a few craft beers too. 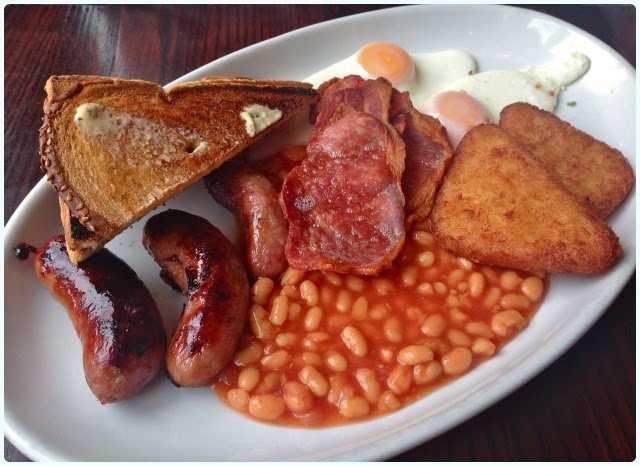 Fry Up - bacon, eggs, sausage, beans, hash browns, mushrooms, tomato and toast (sans mushrooms and tomatoes): My husband declared this the best full English he'd had in some time. This is high praise indeed! He particularly liked the toast, which was quite thin, but was flavourful and sported plenty of melted butter. Cheese Burger - homemade beef burger, seasoned with black pepper and herbs, served with cheese, tomato chutney, barbecue sauce, onion ring and chunky chips: A burger is always a good barometer. Something simple that often goes bad in the wrong hands. I really enjoyed Fallow's version. Simple yet tasty, this got a virtual round of applause when I posted a picture to Twitter this afternoon. 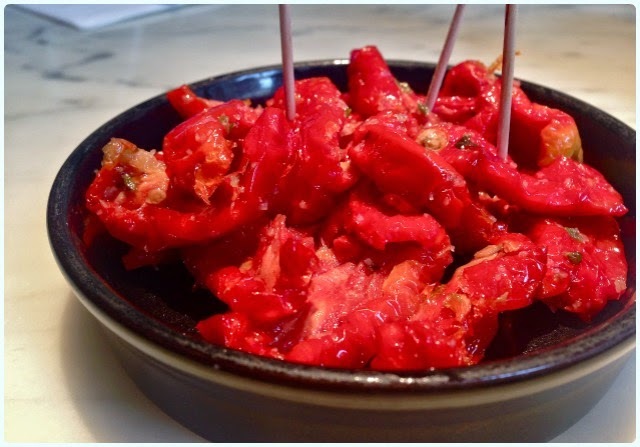 We both loved the vibe at Fallow; quieter than its Northern Quarter counterparts, but still serving good quality food in a relaxed environment. The chaps running the place were friendly, and service was fast. A great little place to spend a slow Saturday morning. Disclaimer: I was invited by Fallow to sample their new menu. I was under no obligation to say anything nice, and I was in no way threatened by that sinister monkey across the road.